The Times is the No.1 daily newspaper for business readers and reaches 50% more decision makers than the FT or the Daily Telegraph. "We always recommend placing adverts into The Times & Sunday Times to our 'Management Franchise' & 'Higher Investment' franchise clients as it is the ONLY medium that delivers the right profile of reader for these clients. Much as the response may emanate from the clients website it is clear, from the feedback we receive, that these candidates only visited the website AFTER seeing the advert in the The Times & Sunday Times." 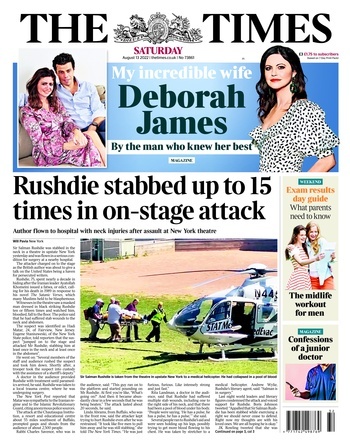 The Times is one of the world's most respected newspaper titles. Established more than 200 years ago it continues to lead the market in the quality and depth of its journalism. According to the British Business Survey (Sept 2011), The Times is the No.1 daily newspaper for business readers and reaches 50% more decision makers than the Financial Times or the Daily Telegraph. The Times won the Business and Finance Newspaper Team of the Year Team Award at the 2011 Press Awards. Please read more about our business readership.